MILWAUKEE — #ZYNISLIFE isn’t just a hashtag at the innovative Milwaukee-based company. It embodies the fundamental foundation of goodness, from fair and equitable treatment of people, to charitable contributions, to community engagement, social justice and protecting the environment. The encapsulation of this hashtag is now demonstrated to the entire world with ZYN’s addition to the Certified B Corp™ global community, making ZYN 1 of only 10 in the State of Wisconsin, 1 of only 165 in the U.S. Food & Beverage sector and 1 of only 2,668 across the World. “This isn’t about us, it’s about our mission at ZYN and the greater good we aspire to do each and every day. B Corps are important because they inspire all businesses to compete not only to be the best in the world, but to be the best the world. This is a major milestone since it signifies to the world that we are more than just another profit motivated company. In fact, it shows the world that we are a socially, ethically and environmentally responsible company that places highest value on people, planet and purpose, along with profits,” stated the ZYN team. SUR Natural Health Brands LLC is a holistic health & wellness lifestyle company that is making accessible the ancient, time-tested wisdom from around the world for modern consumers in convenient and effective foods & beverages. 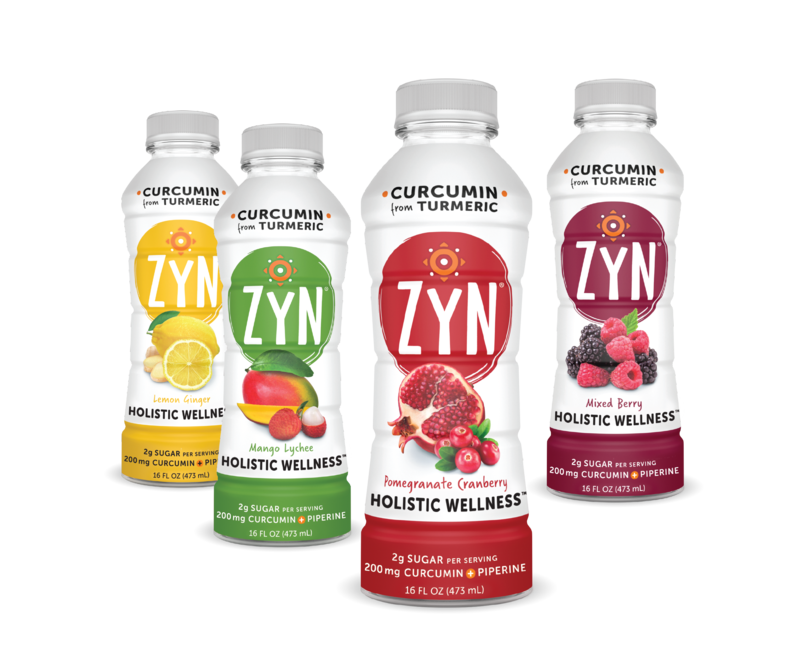 ZYN’s first product line, CURCUMIN (from Turmeric) infused beverages are first-to-market refreshing and healthy drinks that are crafted directly from CURCUMIN (the source of Turmeric’s health benefits) and PIPERINE (black pepper fruit extract that optimizes absorption). ZYN beverages are available in 4 refreshing flavors (Mango Lychee, Pomegranate Cranberry, Lemon Ginger & Mixed Berry) and are low in sugar (2 grams per serving), calories (10 calories per serving) and carbs (3 grams per serving), and contain no artificial sweeteners, preservatives, colors, or flavors. Today, ZYN CURCUMIN (from Turmeric) infused beverages are available at rapidly growing number of retailers, campus cafes (corporations, hospitals, universities, etc. ), restaurants and professional and collegiate sports teams’ cafes across the U.S., with Canadian expansion planned for 2019.